For reluctant writers and for creative writing enthusiasts, using technology to write a cartoon is a fun, highly motivating activity. Digital storytelling sparks students’ imaginations. Adding elements such as images, callouts, text boxes, starbursts, and word art inspires students even more. Then creating animation effects and transitions makes the writing activity exciting and challenging. How can you integrate comic strip writing into curriculum? Here are a few ideas! Write an Original Story: Plan a story or simple scenario that has a beginning, middle, and end. Divide the action into panels. 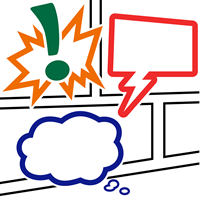 Use text boxes to describe the scene, callouts for characters to speak or think, and clip art to illustrate the action. Only a Dream: Create a dream sequence that shows a series of imaginary scenes. This is an easy way to plan a digital story. Illustrate a Wacky Scene: Have fun with a cliché or popular expression. Make a simple scene that explains what happens when pigs fly, there is a blue moon, or it starts raining cats and dogs. Invent a Superhero: Create a character and give them a name and superpower. Have the hero save the day! Take part in a rescue mission, engage in an epic battle with a powerful foe, stop a crook, or retrieve a lost item. Tell a Joke: Make people laugh! Use one slide to make a silly scene, two slides to show before and after clips, or several slides to tell a knock-knock joke. Transform a Popular Story: Remake a nursery rhyme or fairy tale into a cartoon. Swap the characters, adjust the story line, or rewrite the ending to create a modern twist on an old favorite. Retell a Story: Summarize the main parts of a story. Sequence the key events using slides as scenes. In the first scene introduce the characters and setting. The following slides illustrate the action. Rewrite the Ending: Produce an animated scene that illustrates a different ending. Include a slide that explains why this ending is better than that of the author. Makeover a Realistic Story into a Cartoon: Consider what a story would be like if the people were substituted with cartoon characters, the setting shifted to an imaginary place, but the plotline remained similar. Create a short animated clip of the cartoon version. Join the Action: Insert yourself into the story. What advice would you share? How would you help? Recreate a scene from the story. Use a clip art character, photo, or web cam image to put yourself into the scene. Does your advice or behavior change the ending? Form a Connection: Reflect on the story. What connection do you have? Do you like the same things as the main character, have you shared a similar experience, or does the story remind you of something you have seen or read? Explain the connection and use evidence from the book or your life to support your ideas. Conduct a Character Analysis: How does the character change as the story unfolds? Create a three panel animated comic strip. In the first panel introduce the character at the beginning of the story. Use callouts and textboxes to show their mood, describe their character traits, and explain their role within the story. In the second panel illustrate an important event that causes a change or growth within the character. In the final panel show the character at the end of the story. How are they different? 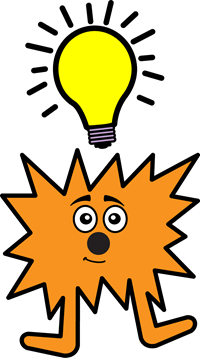 Use any of these ideas with TechnoToon and Google Slides or Microsoft PowerPoint to inspire and spark the inner author in your students.